Colombo, March 26 (newsin.asia): The Pakistani High Commissioner in Sri Lanka, Maj. Gen. (R) Dr. Shahid Ahmad Hashmat, said here on Monday that modalities are being discussed with the concerned authorities in Sri Lanka to establish a “world-class” high-tech university here under the auspices of the COMSATS University in Islamabad. 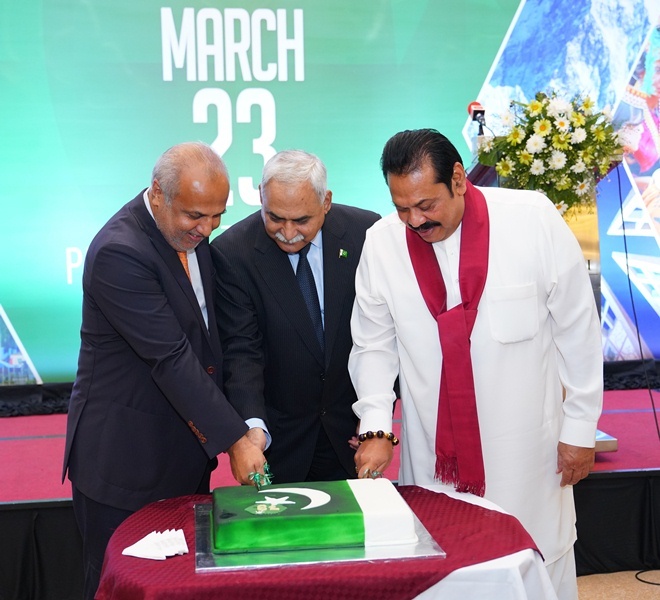 Speaking at a reception connected with Pakistan’ 79th National Day, Dr.Hashmat said that the High Commission will be awarding 1000 scholarships to Sri Lankan students in diverse fields and will support exchange of faculty members and students. The Commission on Science and Technology for Sustainable Development in the South (COMSATS) is an international organization. It aims to reduce the ever-growing gap between the developed and developing world through useful applications of science and technology. The Third World Academy of Sciences (TWAS) initiated the proposal for the formation of COMSATS under the leadership of the Pakistani Nobel Laureate, Dr. Abdus Salam. The foundation-conference of COMSATS was held at Islamabad in 1994. Representatives from thirty-six countries attended. The participants included representatives of international organizations, like UNESCO, UNIDO, UNEP and the World Bank. The conference decided that the Headquarters / Secretariat of the Commission would be based permanently at Islamabad, Pakistan, and the Head of State of Pakistan would act as the first Chairperson of the forum. It was agreed that the host,the Government of Pakistan, would provide for the operational and administrative expenses of the Secretariat, while the development programs of the Commission would be supported and financed through the Technical Assistance Fund. This fund would be established by contributions from member countries, income from services provided to member countries, grants from international agencies and project funds, if under taken under contract. The CUI was established in 1998, as a project of COMSATS, which is an inter-governmental organization with 21 member states in three continents; Asia, Africa and Latin America, namely Bangladesh, China, Colombia, Egypt, Ghana, Iran, Jamaica, Jordan, Kazakhstan, Korea (DPRK), Nigeria, Pakistan, Philippines, Senegal, Sri Lanka, Sudan, Syria, Tanzania, Tunisia, Uganda and Zimbabwe. Currently, CUI has the status of a public sector degree awarding higher education institution, and was given a charter by the Federal Government of Pakistan in August 2000. High Commissioner Hashmat said that the foundation of strong brotherhood between Pakistan and Sri Lanka was laid in 1948 when the former Prime Minister of then “Ceylon”, Hon. D.S. Senenayake, visited Pakistan. “But the relationship between Sri Lankans and Pakistanis has existed for over two thousand years. These relations are further cemented by the commonality of eternal values of universal peace and love, espoused both by Buddhism and Islam,” Dr.Hashmat said. “Pakistan supports peaceful resolution of all bilateral and regional disputes through meaningful negotiations and mediation,” he said and appreciated Sri Lanka’s support for promotion of peace and harmony in South Asia. Chief Guest, Hon. Rauff Hakeem paid a rich tribute to the Government and people of Pakistan for always being supportive to Sri Lanka in the time of need. He recalled the robust relations between the two countries and said that Pakistan and Sri Lanka have always maintained close, cordial and mutually supportive relations which are broad-based and multifaceted. A large number of guests, including Speaker Parliament Karu Jayasuriya, Opposition Leader Hon. Mahinda Rajapaksa, several Ministers, Members of Parliament, Diplomats, senior civil & military officials and people from different walks of life attended the reception.